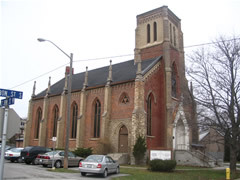 Welcome to the website of the St. Arsenije Sremac Serbian Orthodox Church-School Congregation of Whitby, Ontario, Canada. You will find relevant information which will help you keep in touch with members of the church-school congregation of St. Arsenije Sremac, and find out what is new - events, celebrations and how to get involved with your church-school community. Our church-school congregation consists of one parish which reaches over the territory of the Eastern GTA area: Scarborough, Pickering, Ajax, Whitby, Oshawa and a bit further East to the area of Kingston. We are inviting Orthodox Serbs and other people of good will to visit our church-school community.